Trent Alexander-Arnold feels getting the early goal in the second half was key to Liverpool getting the three points at Brighton, after the Reds won 1-0 to go seven points clear at the top of the table. Brighton’s dogged and disciplined defending in the first half frustrated Liverpool and the league leaders were struggling to create clear cut scoring opportunities for themselves. Liverpool got the break early in the second half when Mohamed Salah was fouled inside the box and the Egyptian converted the resultant penalty to score the winning goal in 1-0 victory. 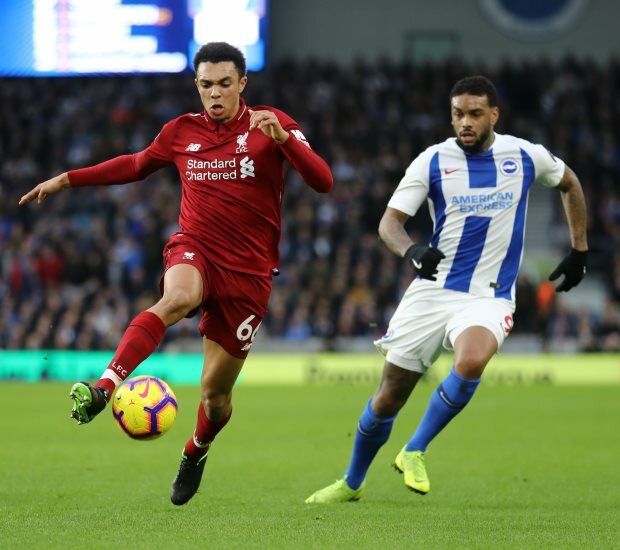 Alexander-Arnold admits that it was only going to be difficult to cut open the Brighton defence and conceded that Liverpool felt frustrated in the first half. But he stressed the importance of Salah getting the early goal after the break and the Liverpool defender is delighted that the side showed the character needed to close out the three points from a difficult game. Alexander-Arnold said on Sky Sports: "We knew it was going to be difficult. We struggled to score against them at home. We got the goal in the end and we held in there. "It's a credit to the lads that we showed that desire to get the three points. "It was frustrating as a team in the first half. They are well organised and it was tough to break them down. "In the second half it helped us getting that goal early on and they had to attack us more which played into our hands. "To be the best you have to win a lot of your games. It is a tough league and we go into every game to get a win. “We're disappointed when we draw as well as lose. We're all happy and hopefully we can push on." Liverpool will be in action again next Saturday when they will host Crystal Palace at Anfield, but before then will look to see how title rivals Manchester City respond.